Human stem cells can be differentiated to produce other cell types, such as organ cells, skin cells, or brain cells. While organ cells, for example, can function in isolation, brain cells require synapses, or connectors, between cells and between regions of the brain. In a new study published in Restorative Neurology and Neuroscience, researchers report successfully growing multiple brain structures and forming connections between them in vitro, in a single culture vessel, for the first time. “We have developed a human pluripotent stem cell (hPSC)-based system for producing connections between neurons from two brain regions, the neocortex and midbrain,” explained lead investigator Chun-Ting Lee, PhD, working in the laboratory of William J. Freed, PhD, of the Intramural Research Program, National Institute on Drug Abuse, National Institutes of Health, Baltimore, MD. Mesencephalic dopaminergic (mDA) neurons and their connections to other neurons in the brain are believed to be related to disorders including drug abuse, schizophrenia, Parkinson’s disease, and perhaps eating disorders, attention deficit-hyperactivity disorder, Tourette’s syndrome, and Lesch-Nyhan syndrome. However, studying mDA neurons and neocortical neurons in isolation does not reveal much data about how these cells actually interact in these conditions. This new capability to grow and interconnect two types of neurons in vitro now provides researchers with an excellent model for further study. “This method, therefore, has the potential to expand the potential of hPSC-derived neurons to allow for studies of human neural systems and interconnections that have previously not been possible to model in vitro,” commented Dr. Lee. Using a special container called an “ibidi wound healing dish,” which contains two chambers separated by a removable barrier, the researchers used hPSC to grow mDA neurons and neocortical neurons in the two individual chambers. The barrier was removed after colonies of both types of cells had formed and further growth resulted in the formation of synapses between neurons from each colony. Caption: An example of TH-positive projections (red) from the inner chamber to the area of the outer chamber after 21 days. Scale bar = 100 mm. 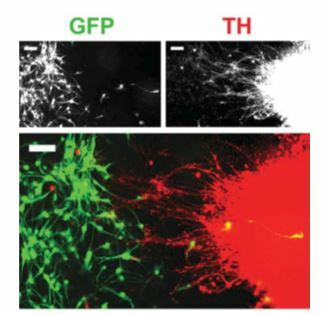 GFP (green) indicates neocortical neurons and TH (red) indicates mDA neurons. In the lower picture, each type has been tagged with fluorescent markers so that the locations and types can be identified. The fine tendrils indicate the growth of synapses between the neocortical and mDA neurons, mimicking the structures found in vivo. Future experiments could employ modifications of this method to examine connections between any two brain regions or neuronal subtypes that can be produced from hPSCs in vitro. “A new technique for modeling neuronal connectivity using human pluripotent stem cells,” by Chun-Ting Lee, Raphael M. Bendriem, and William J. Freed, DOI 10.3233/RNN-1140488, Restorative Neurology and Neuroscience, published by IOS Press online ahead of Volume 33, Issue 3 (June 2015). Full text of this article is freely available at http://content.iospress.com/download/restorative-neurology-and-neuroscience/rnn140488?id=restorative-neurology-and-neuroscience%2Frnn140488. For additional information contact Daphne Watrin, IOS Press at +31 20 688 3355 or d.watrin@iospress.nl. Journalists wishing to interview the authors may contact Chun-Ting Lee directly at 443-413-8658, CLee@intra.nida.nih.gov, or cxl787@med.miami.edu.